39 w w w . M o d e r n T i r e D e a l e r . c o m ©20 1 8 C M A , L LC . Learn more at www.DoubleCoinTires.com MISSION EXCELLENCE We are on a mission to deliver excellence to our customers in every aspect of our business. It's more than ranking #1 in fi ll rates among commercial tire dealers* and off ering an aggressive TBR 7-year, 3-retread warranty. To me, it means rapid-response customer service and being a partner in a customer's success. Double Coin's mission is excellence, and for me it's personal. *Based on a 2016 brand study by a major industry publication Because of we're committed to premier rapid response customer service. Teresa Galvan Director of Customer Service Today's proper material handling protocol stands in stark contrast to chunking, an outdated practice that was popular for many years. 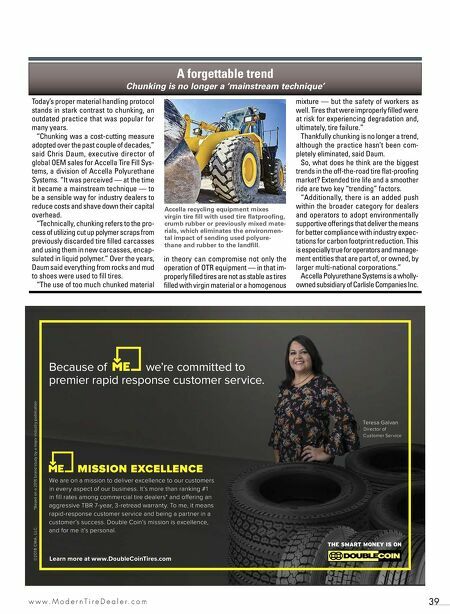 "Chunking was a cost-cutting measure adopted over the past couple of decades," said Chris Daum, executive director of global OEM sales for Accella Tire Fill Sys- tems, a division of Accella Polyurethane Systems. "It was perceived — at the time it became a mainstream technique — to be a sensible way for industry dealers to reduce costs and shave down their capital overhead. "Technically, chunking refers to the pro- cess of utilizing cut up polymer scraps from previously discarded tire filled carcasses and using them in new carcasses, encap- sulated in liquid polymer." Over the years, Daum said everything from rocks and mud to shoes were used to fill tires. "The use of too much chunked material in theory can compromise not only the operation of OTR equipment — in that im- properly filled tires are not as stable as tires filled with virgin material or a homogenous mixture — but the safety of workers as well. Tires that were improperly filled were at risk for experiencing degradation and, ultimately, tire failure." Thankfully chunking is no longer a trend, although the practice hasn't been com- pletely eliminated, said Daum. So, what does he think are the biggest trends in the off-the-road tire flat-proofing market? 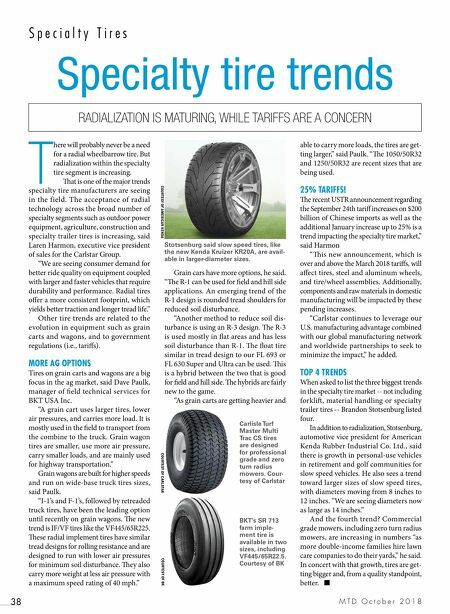 Extended tire life and a smoother ride are two key "trending" factors. "Additionally, there is an added push within the broader category for dealers and operators to adopt environmentally supportive offerings that deliver the means for better compliance with industry expec- tations for carbon footprint reduction. This is especially true for operators and manage- ment entities that are part of, or owned, by larger multi-national corporations." Accella Polyurethane Systems is a wholly- owned subsidiary of Carlisle Companies Inc. A forgettable trend Chunking is no longer a 'mainstream technique' Accella recycling equipment mixes virgin tire fill with used tire flatproofing, crumb rubber or previously mixed mate- rials, which eliminates the environmen- tal impact of sending used polyure- thane and rubber to the landfill.